A Witches Brew of writing songs and filming dancers.. My Artist Residency with CoastWord Festival.. so far.. When I was first approached in the summer by Hannah Lavery to be an Artist in Residence with CoastWord, I was delighted and honoured. I had performed at CoastWord a couple of years ago with our band GOL and screened some of my short films. The evening had such a great atmosphere and I remember how the audience danced with such wild abandon to the music, showing us the true spirit of Dunbar! The open remit of the residency is such a liberating feeling but also a slightly terrifying one, as there as there are so many possibilities to start creative work when it comes to Dunbar and East Lothian. The area is literally overflowing with stories and fascinating history. I knew I wanted to find out more about the Witches of Dunbar and East Lothian. That dark, violent, mysterious often misunderstood time in Scotland and East Lothian’s history. Whilst researching the stories of the witches of East lothian I found myself staring at some strange map co-ordinates. They were the co-ordinates of the "Witches Stone" in Spott, just outside Dunbar. I remember just staring and staring at this small picture of a sad forgotten rock, surrounded by a metal fence. The rock is thought to mark the place of the execution in 1698 of Marion Lillie of Spott (known as the Rigwoody witch) who was simply accused of speaking roughly to a neighbour and frightening a pregnant woman. She was also apparently one of the last woman to be burned in Southern Scotland. I was really taken back by this signifiant piece of history and the fact Marion Lillie had done nothing so awful as to then warrant the punishment of being strangled first and then burnt at the stake! I was also saddened that apart from this Witches Stone there is no memorial to commemorate the massacre of so many women (and some men) in this time in our history. Does the continued inequality towards women today still harken back to these times when all you had to do was have a sharp tongue, be in the wrong place at the wrong time and you could get yourself killed? It certainly got me thinking and reflecting. I knew I wanted to make my artist residency (using the medium of music and film), around the stories of the women who were wrongly accused of witchcraft .When I mentioned this to Hannah Lavery she said, in her wonderfully supportive and enthusiastic way. “ That sounds great and I know just the book for you to read!” and two days later this incredible book arrives through my post box, ‘The Deil’s Ain - The Story of Witch Persecution in Scotland’ by Roy JM Pugh, who also happens to be a resident of Dunbar. This is a brilliant book for anyone who wants to understand this dark period of Scottish history and to have the facts laid out clearly. The arbitrary nature of being killed for being different made me think about how politics today is still drawing on the ‘scapegoating’ techniques used during the massacre of the witches. You only have to look at some of the intolerant racist attitudes that have surfaced after the Scottish and EU referendums and the rise in hate crimes towards those who are seen as different to see how our politicians are still using this ‘persecution of the other’, to divide us and fill us with a fear of each other diverting attention away from real problems. The more I read the more furious I became. That we have forgotten these women is sad but that we have in someways also brushed this period of history under the carpet made me think about how important it is to keep remembering the past so we don’t make the same mistakes in our future. The scapegoating of those who are different is something still practised today but in more sophisticated ways. I was also wanting to understand more about why it was mainly women who were accused of being witches during that time and why was it orchestrated as such gender-specific violence, what on earth could be so threatening about being a woman? With all this in mind, I decided that I wanted to write songs about these women that celebrated their lives. Many of them were killed simply for being midwives, herbalists, rich widowers and poor vagabonds. A petty local jealousy or mistrust could lead easily to your death. I was also struck by the fact that some of them had committed suicide after being accused as they knew that there was no escaping the biased and unfair trial systems which were rigged against them. Through the mediums of music and film, I want to explore the idea that the spirit of ‘being different’ cannot be snuffed out and that these women still on in the lives of all those who are different and celebrate being different. With the help of my trusty collaborator and husband Peter Vilk, we have started composing and arranging some of the songs I have written and, as they gather shape, I am getting excited about sharing them at the Coast Word Festival. Alongside the songs, I am creating Film/Art works that are visual moving art work ‘memorials’ to the women. I have been filming dancers and physical theatre performers in various places and spaces. I approached my long term collaborator Skye Reynolds, who is a wonderful Australian choreographer and dancer based in Scotland and we have in the past worked together on creative projects in Iran and Bosnia Herzegovina. She is a brilliant improviser and I wanted to film her in Spott and Dunbar, dancing and moving in the spaces that have historic importance in the witches persecution and story. We had chosen the coldest day to film outside, there were snow flurries and at one point my fingers were too cold to hold the camera! Thanks to lovely writer and poet Carey Douglas - Carnie who lives in Spott, we warmed up with a cup of tea at her home. She then kindly walked us along to the Witches Stone where we laid some flowers. Carey brought with her a very special cat who then decided to sit on the witches stone and would’t leave! Through working with Skye I have also been lucky enough to collaborate with some of the students of the Diploma in Physical Theatre Practice (at Summerhall). With Skye and Jane Howie (their course director) they had spent a few weeks creating physical motifs exploring images relating to the witches persecution and images of protest. 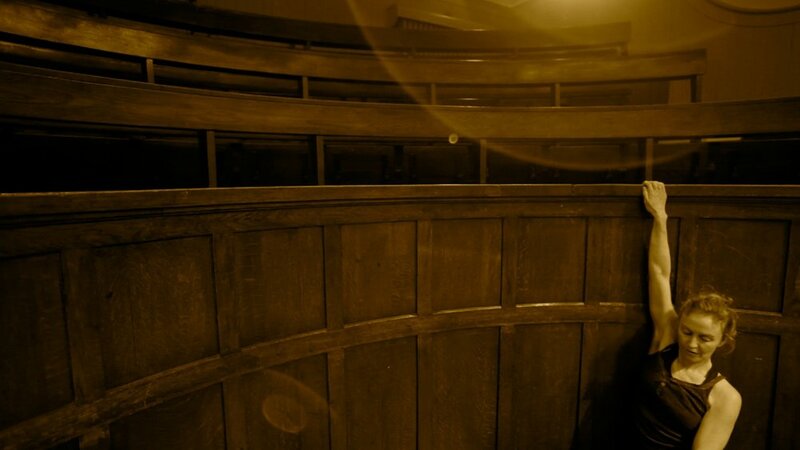 Thanks to Sam Gough General Manager of Summerhall who gave us access to the space, we could film the physical motifs in the Anatomy theatre, which worked as a great backdrop for the physical theatre. As you can see from the stills earlier in the blog, I also filmed with a young and very talented dancer Dido Knoben in North Berwick in the ruins of the North Berwick church, grave yard and along the West beach as the light was falling out the sky.